The Lord of the Rings trilogy offers another officially licensed reproduction sword in this replica of the sword of Strider. Strider was one of the mysterious Rangers of the North, feared and distrusted by the folk of Eriador because of the Rangers’ grim appearance and nomadic lives. However, the Rangers protected these same people from the forces of evil. 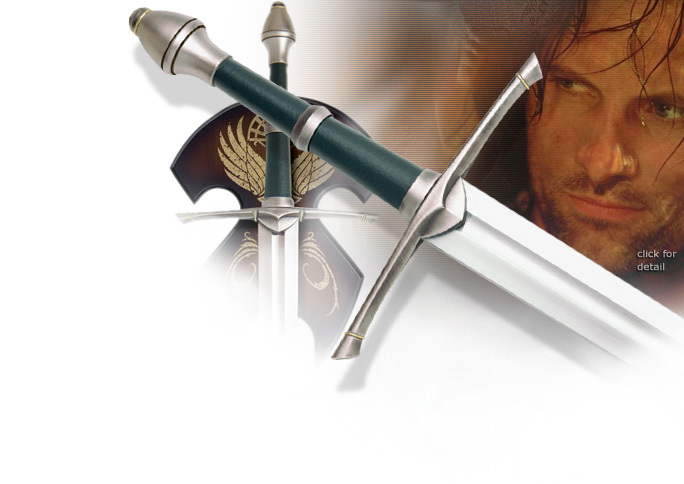 Strider was in fact Aragorn, the heir to the crown of Gondor. This sword is the plain battle sword he used while on his missions against the agents of Sauron. This item measures 47 1/4" overall and features a 36" blade of 420 stainless steel. This sword also offers a solid metal cross guard and pommel with antique metal finish and genuine leather wrapped grip. This item includes a 10-5/8" x 13-1/4" x 3/4" wood wall plaque, silkscreened with the heraldic insignia of the Kingdom of Gondor, for prominent display. Hardware, instructions and certificate of authenticity included. See Model UC1366LTNB for the STRIDER SCABBARD sold separately.